Chocolate-covered nougat has met perfection...try them frozen. Bite size versions and mini-bars, along with the classic long bar. It doesn't matter the size, the flavor is huge! 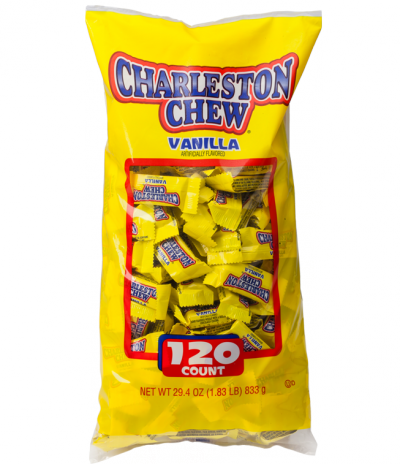 Chewy, flavored nougat wrapped in a rich, chocolaty coating have made Charleston Chew a true American. Available in strawberry and vanilla too! They're frequently enjoyed frozen, offering the classic "Charleston Chew crack" as folks love to break them into small pieces prior to eating. Share the Charleston Chew Experience with Charleston Chew Small Bars, scaled-down versions of the original Charleston Chew, individually wrapped. They're perfect for parties, holidays, or everyday sweet tooth snacking. And of course, they're ideal when pulled from the freezer, as they're every bit as 'crackable' as their full-sized namesake. 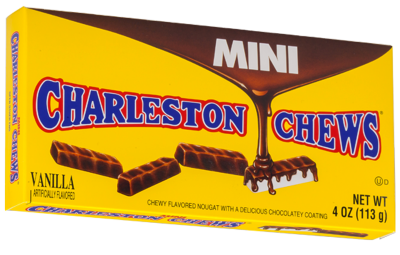 Just like their namesake, the Charleston Chew, these single-serving boxes of bite-sized mini bars are full-flavored versions of the original vanilla Charleston Chew. Enjoy the chewy, flavored nougat wrapped in a rich, chocolaty coating of Charleston Chew Mini Bars.